» Oberlo Review: Is this Ecommerce Tool Right for You? Oberlo Review: Is this Ecommerce Tool Right for You? The ecommerce business has been growing at an astounding rate of 23 percent year-over-year, it’s only natural for entrepreneurs and small businesses to turn their attention to the online world. In the early days of the internet, launching an online store was a time consuming, expensive, and downright stressful task. Today, however, access to a variety of tools and applications has made this a simple process. This is where Oberlo has made a name for itself. In short, Oberlo is an online marketplace that connects merchants and suppliers. So, if you want to sell online, you can use Oberlo to search for and find the best products. It’s as simple as that. But Oberlo goes way beyond a “marketplace”. With Oberlo, you can pretty much automate your entire store and use it to scale your operation to boost your revenue tremendously. In the early days of Oberlo, the company was primarily a dropshipping tool. This gave online storeowners the ability to find and sell thousands upon thousands of items, all without ever touching the product. While Oberlo is still a major player in the dropshipping space, it has shifted its focus to become more of a marketplace for finding and selling products. Your job is simple: add products to your store, generate traffic to your website, and make sales. Once a sale is made, it only takes a couple clicks to place the order with your supplier. From there, the supplier ships the product directly to the consumer, meaning you never have to concern yourself with any aspect of inventory management or shipping. Inventory management can be a huge headache for online storeowners. Oberlo has set out to change this with its advanced dropshipping business model. In addition to the ability to easily add products to your store, Oberlo provides real time inventory and price updates. With this technology powering your store, you never have to worry about selling a product above your retail price or one that is out of stock. Just because you rely on a dropshipping business model doesn’t mean you can overlook the importance of customer service. Shipment tracking is extremely important in today’s day and age. Customers want their items now, not later. You need to know where your orders are at all times, as this allows you to provide your customers with the best possible experience. Oberlo may not be the only provider in this space, but it’s definitely one of the best thanks in large part to its long list of dropshipping features. Edit product images, titles, descriptions, and more. Once you import a product, you can make changes to ensure that it fits in with the rest of your store while also attracting your target audience. Track your sales. It can be great fun to find products, add them to your store, and create a beautiful experience for your visitors. Even so, none of this matters if you aren’t making sales. Oberlo allows you to easily track your earnings through a powerful sales dashboard. Note: you can track expenses as well. Connect existing products. Do you have your own products to sell? Are you also sourcing products from local suppliers? 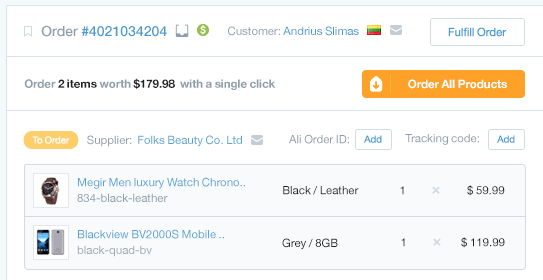 Oberlo allows you to connect products you’re already selling, displaying them side-by-side with those that you import for dropshipping. Create multiple user accounts. There’s a good chance that you aren’t the only person managing your online store. Even if this isn’t the case today, it could change in the future. You have the option to create as many user accounts as necessary. Oberlo realizes that there is more to an online store than offering a large selection of high quality products. This is why there are so many sales tools for users to implement. Just the same as the ecommerce industry as a whole, Oberlo has grown and adapted with each passing year. Since its founding in September 2015, merchants have sold more than 85 million products with the help of Oberlo. In fact, the company has had so much success in a short period of time that it was acquired in May 2017 by Shopify for $15 million. When you combine Oberlo’s feature list with the ability to access a large selection of products, you have a tool that has helped thousands of entrepreneurs achieve great success in the ecommerce space.